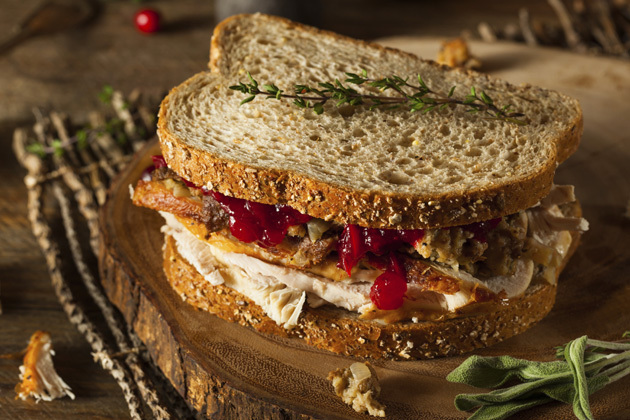 Who doesn't love a turkey sandwich?! A great way to feed friends and family after Christmas Day, using all those delicious leftovers from the main meal! Heat a frying pan and add the pancetta. Cook for 3-4 minutes until the fat begins to melt, add apples and cook for 5 minutes until golden and soft. Transfer to a plate. Add the turkey and thyme to the pan, season well and add 2 tbsp water. Heat gently for 3-4 minutes until piping hot. Meanwhile, mix the fennel, celeriac, yoghurt, mustard and lemon juice. Slice open each roll, and add a few lettuce leaves. Add a quarter of the slaw to each, then top with the turkey and caramelised apple and pancetta. Will you be trying this out at home?